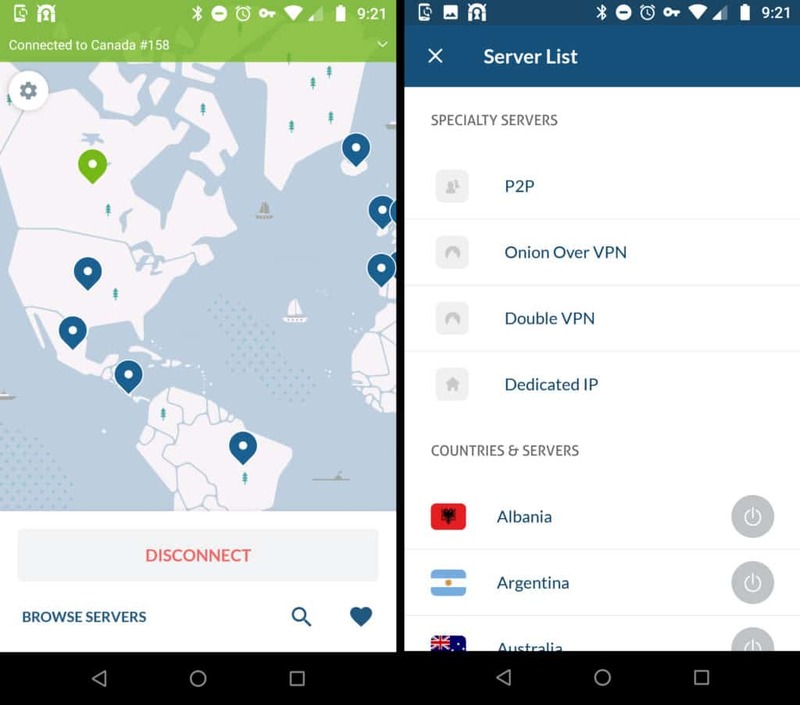 NordVPN is an powerful VPN service for those who like options. Offers lots of servers, zero logs, works with Netflix, 6 connections, and live support. 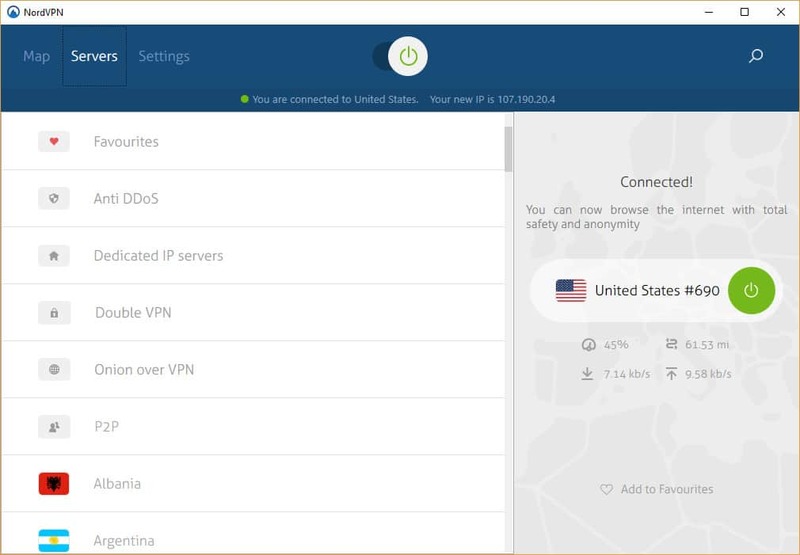 Panama-based NordVPN has been in the VPN game for over 10 years, and it shows in how well it manages to combine so many powerful features into an intuitive and easy-to-use package. NordVPN doesn’t just let users choose a location when connecting to a VPN, it allows them to select a VPN based on how they use it, be it streaming TV, ultra-secure privacy, anti-DDoS, or anonymity. NordVPN subscriptions start out at $11.95 per month if you pay one month at a time. Paying for a whole year at once will cut the price in half to $6.99 a month. 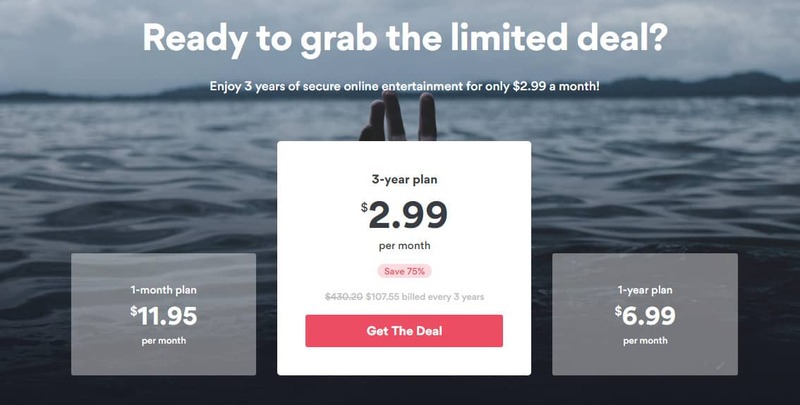 Finally, our reader-exclusive deal with NordVPN drops the price of a 3-year plan to a mere $2.99 per month (75% saving), which is as rock-bottom as it gets for a quality VPN. Customers can pay with a credit card, PayPal, Bitcoin, and some third-party payment gateways. All subscriptions come with a 30-day money-back guarantee for accounts in good standing. NordVPN is one of the most gracious providers we’ve seen when it comes to connecting more than one device at a time, with up to six simultaneous connections allowed. The only caveat is that each must either use different servers or be on different VPN protocols. The default VPN protocol varies depending on which version of the app you use. The iOS and Mac versions from the Apple App Store, for example, use IKEv2/IPSec. 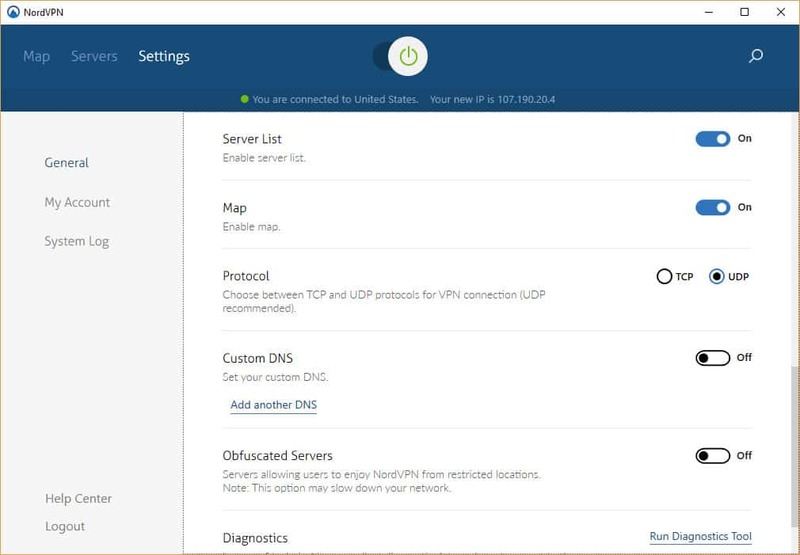 The versions downloaded directly from the NordVPN website, however, use OpenVPN over UDP as the default protocol, but OpenVPN over TCP is also available in the app. L2TP/IPSec, PPTP, and SSTP are not supported in the apps but they can be set up manually. Users can either choose a server by country or by the type of server. Standard VPN connections make up most of the more than 4,000 servers in over 60 countries. Users can also choose from specialized servers like double VPN, Tor over VPN, and dedicated IP. Double VPN means a standard VPN is routed through a second VPN, doubling the encryption. Tor over VPN routes your traffic first through a VPN and then through the Tor network, adding anonymity to privacy. Dedicated IPs are ideal for IP-sensitive applications and websites, which require you log in from the same IP address every time (e.g. mobile banking). DNS leak protection and an internet kill switch are both included in the app. DNS leak protection prevents DNS requests from going to your ISP instead of NordVPN’s own DNS servers, improving privacy. A kill switch halts internet traffic in the event that the server connection drops, so nothing gets leaked onto your ISP’s network unencrypted. Most VPNs that have kill switches disable the internet altogether when a connection drops. NordVPN’s solution is a bit more nuanced. You can add specific running processes to the kill list, so only certain programs will lose their connection. If you wanted to halt downloads on your torrent manager but not your browser when the connection drops, for instance, the NordVPN app makes that a possibility. A full-on kill switch is also available. A recent addition to the NordVPN apps is CyberSec, which when enabled blocks ads, malware, and phishing threats. If you’re like me, you’ve already got most of that stuff set up on your browser and antivirus program, but another layer of security never hurts. NordVPN offers encrypted proxy extensions for Chrome and Firefox browsers. Think of these as VPN-ish tools that only encrypt and reroute web traffic from your browser and not from your entire device. NordVPN does not make an app specifically for Amazon Fire TV or Fire TV Stick, but you can get its Android app running on Fire OS with a bit of finesse and a mouse control app on a smartphone. See our tutorial on how to install NordVPN on Fire TV. Yes, and better than most at that. NordVPN unblocks several streaming sites including but not limited to Netflix, BBC iPlayer, ABC iView, and Hulu. NordVPN accomplishes this through its trademarked SmartPlay feature, which is toggled on in the settings by default. A quick test by us proves NordVPN works as promised with Netflix. We’ve rounded up here a list of other VPNs for Netflix which have worked in our testing and here are more details on NordVPN and Netflix. If that fails, however, Nord instructs users to go into its app’s Settings menu, select Advanced Settings, and toggle on Obfuscated servers. This has the effect of making encrypted internet traffic look unencrypted, which prevents China’s deep packet inspection system from identifying VPN connections. It might add a small amount of latency, but most users probably won’t notice a difference in speed overall. The obfuscated servers feature is currently only available in the Windows, Android and MacOS versions of the app. Read more on using NordVPN in China here. How Easy is NordVPN to Use? After registering an account, setup is a simple standard download and install process. Each time the desktop app is opened, you’ll need a username and password to log in. You can organize the available servers by country or by server type, as mentioned above. In the latter, the app gives the current capacity and latency in milliseconds for each server. Find the one you want and click connect. The status of all servers can be refreshed at any time. The app looks great in Windows, and even novice users will find it unintimidating. But one downside we can’t show you in screenshots is how bulky and slow it is. After clicking a button on the app, it often takes several seconds to respond. I often find myself wondering if I actually clicked the mouse or not because it just doesn’t show any signs of life. I wouldn’t say the laptop I tested NordVPN on is powerful, but it’s not an old junker, either. It seems all those bells and whistles are weighing the app down. If you close the main NordVPN window, the app will remain active in your system tray. Right-clicking the system tray icon will bring up a list of the five most recent servers you’ve connected to. 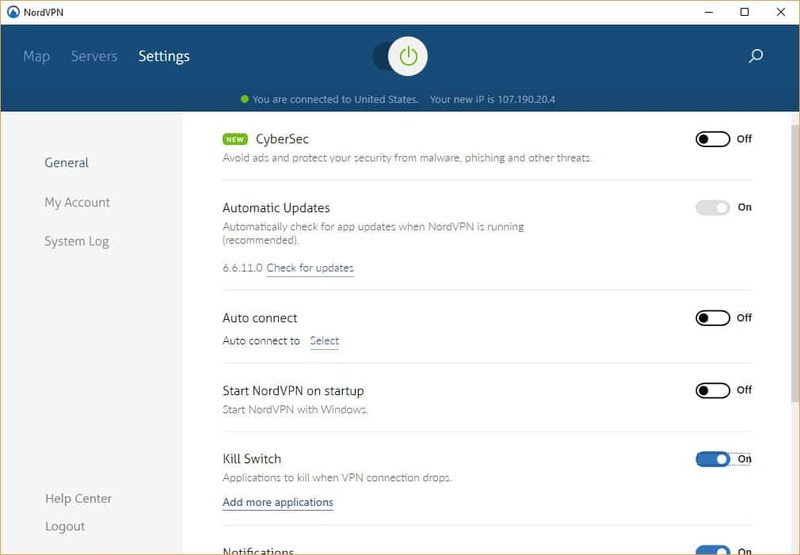 In the settings menu, you can opt to start NordVPN when the computer starts, toggle DNS leak protection and CyberSec, set your own DNS servers, and change the protocol. This is also where to add active process that should cut off from the internet by the kill switch. NordVPN’s mobile app opens to a slick world map where you can click on a pin to select a country. You can also access the same server list as on the desktop app via the menu, where servers are organized country or by their function: TV streaming, double VPN, Tor over VPN, etc. A handy search function is built in so you don’t have to scroll through the huge server list if you know exactly which server you’re looking for. We wish NordVPN had included the search bar in their desktop app as well. 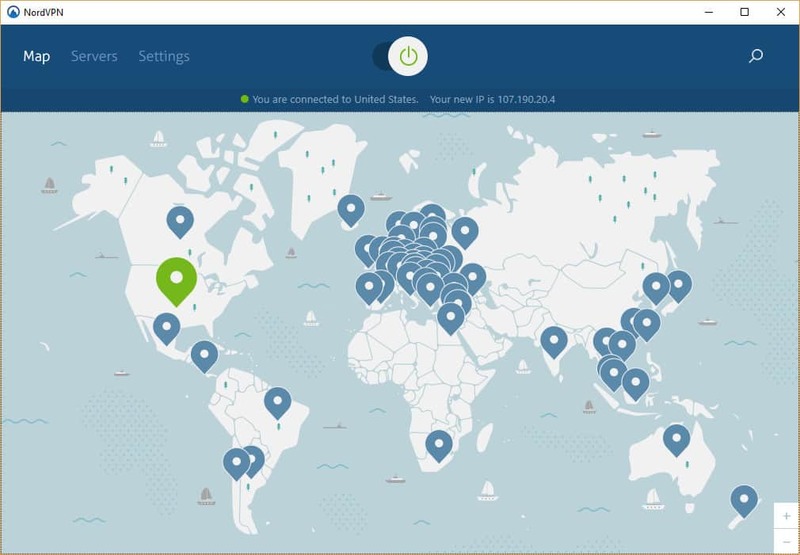 NordVPN boasts an impressive 4000+ servers spread out over upwards of 60 countries. In the United States alone, it operates hundreds of servers. Other popular countries like the UK and Germany have a few dozen each. While the selection is more than most people will ever need, users, unfortunately, cannot specify an exact province or city. This could be an obstacle to those attempting to access content that is blocked based on region. MLB.tv blackouts, for example, block users in specific regions of the United States according to content licensing restrictions split among local broadcasters. NordVPN’s terms of service promise 99 percent uptime. Due to the sheer number of servers to choose from, we never had a problem finding one that worked, but occasionally we did see an inordinate amount of servers showing the « Server down » status. NordVPN tells us that this is a bug in the app, not with the servers, and the issue will be mended in the next version of the app, which is currently in beta. Our connections didn’t drop very often, but several times the app would hang when initiating a connection, forcing us to cancel and try again. This even happened when NordVPN auto-selected a server for us. Most servers seem solid once connected, minus a few bad eggs. We had no problems streaming 1080p HD video or playing Brawlhalla, an online Super Smash Bros-style fighting game. The video was loaded far past the buffer and we didn’t notice any lag or other issues while gaming. To make the speed tests as empirical as possible, we run a series of daily automated downloads through each VPN. A test server in Canada connects to VPN servers in five countries: the US, the UK, Australia, Hong Kong, and Germany. We download a test file of roughly 50MB in size from a CDN in each of those locations. This is repeated four times per day at six-hour intervals. The average download speed for each test is recorded and the aggregate data is displayed in the interactive chart below. NordVPN ranks about the middle of the pack as of time of writing. Note that these results are subject to change as more tests are added. We aggregate tests from the last month to get these averages. Keep in mind that this test is not a definitive indicator of which VPN is fastest. The inherent volatility of the internet adds a significant factor of randomness, so VPN speed tests should always be taken with a big grain of salt. My original location is in Bogota, Colombia, where I run these tests on a 10 Mbps connection. Those with faster connections may well notice a larger discrepancy in speeds. With the desktop app and a standard VPN, all OpenVPN traffic is 256-bit AES encrypted and uses 2,048-bit SSL keys. DNS leak protection is toggled on by default. Tor over VPN routes traffic first through the VPN, and then through the Tor network, allowing users to access .onion websites and adding a strong layer of anonymity. Using Tor over VPN will slow down your connection quite a bit, and your Tor exit node will change regularly, as will your IP address. The double VPN seems a bit redundant to me, but for those who are worried that the default 256-bit encryption and a shared IP address doesn’t offer beefy enough security, then more power to you. This « double hop » VPN, like VPN over Tor, will also make a dent in your download speed. NordVPN boasts a true zero-logs policy. Many VPN providers out their claim they don’t store logs, but what they really mean is they don’t keep logs of what users are looking at. Meanwhile, they do keep session logs of when users log in, how much bandwidth they use, and their IP addresses. NordVPN keeps neither usage logs nor session logs. Panama, where NordVPN is incorporated, has no data retention laws that apply to VPN providers. The only information NordVPN keeps about users is their email, username, and payment information. NordVPN recently added a security featured dubbed WifiSec. With this enabled, the app will automatically initiate a VPN connection whenever a wifi network is joined. It can be set up to auto-connect to Nord on both secured and unsecured Wi-Fi networks. Is NordVPN’s Customer Service Any Good? NordVPN offers both round-the-clock live chat support and a ticket submission system. We were connected to a representative on live chat support within two minutes. The rep seemed knowledgeable about the product and not like an outsourced firm that copies and pastes answers. The website includes a decent array of search-able help and tutorial articles in the support section. Both the website and app are ad-free, and we didn’t receive any unsolicited emails during the test period. NordVPN is a powerful VPN service for those who like options. Customers get a huge range of servers to choose from, along with servers optimized for specific purposes. Security and privacy are top-notch, and NordVPN boasts a true zero-logs policy. Download speeds are very fast, but finding a reliable server can be a process of trial and error. The app looks great and includes a ton of useful features, but it’s extremely clunky and tends to lock up. Live support is fast and knowledgeable.